Decades ago, standing in the backstage receiving line to pay respects to the artist, an elderly gentleman had plenty of time to compose just the correct words of thanks and praise, and upon reaching pianist Gina Bachauer (1913-76) he stated, effusively, "You play like a man!" The comment was not well received. Madame's spine stiffened, and she drew herself up with near-military precision, leaned forward, and replied, "I do not! I play like a strong woman!" June 14-19, 2011: The Music Critics Association of North America, Inc., our oldest association of cultural journalists (established 1956), held its annual meeting in San Francisco in June, in conjunction with the first complete performances of the San Francisco Opera's "American" Ring, produced and directed by Francesca Zambello and featuring Nina Stemme as Brünnhilde. Other hosts for the week included the San Francisco Symphony, with which Yuja Wang was the soloist, and Ojai North, where Dawn Upshaw was the chief attraction in a program produced by Peter Sellars and offered by Cal Performances at the University of California at Berkeley. The panels included some remarkable women - Anja Kampe, the Sieglinde of the first two (of three) Ring cycles, appeared with Zambello (whose massive silver and turquoise Western belt buckle might have given those Rhinemaidens a viable alternative to that troublesome ring, if they'd have been willing to go off the gold standard...) alongside Mark Delavan, the production's promising Wotan; and at a SFS panel, Susan Stauter of the city's unified school district provided an engaging report on the high level of music education there, bolstered by comments from Maestro Michael Tilson Thomas (of the SFS), the orchestra's executive director Brent Assink, and arts researcher Alan Brown. None of this is meant to short-change the MCANA's males - many of the leading critics of the US and Canada were on hand - but it gradually became apparent that some of the ladies responded somewhat more favorably to the new Ring and to the two concerts most of us attended than did some of the men - to use a larger string of weasel words than has appeared here in a long time! The four-evening cycle - formally a prologue with three follow-on music dramas, but often referred to as a tetralogy - is the most expensive show most important opera companies produce. And productions tend to be around for a long time, so it's a safe bet that this just-completed one (portions of which were first done in Washington, DC) will serve as a foundation, for better or worse, for lots of singers just now coming into the Wagnerian pipeline. The San Francisco Opera production is highly controversial, and many traditionalists may have problems with it. This American Ring depicts many things, chief among them the environmental consequences of a lust for power. It has some fingerprints of other productions in recent years - corporate boardroom settings showing Wotan as a CEO, industrialization and its attendant pollution, construction settings both above and below ground, and so on. There are new twists, too - Schwarz Alberich is a prospector, the giants are hard-hat-wearing builders, and the rainbow bridge to Valhalla is an accommodation ladder for a cruise ship, at the base of which the Rhinemaidens linger as the gods traipse off for their new adventures. In part two, the hut is a substantial quasi-A frame house, the encounter between Hundig and Siegmund is set under a littered overpass in a manner that suggests a West Side Story street fight, and the flame-encircled rock resembles gas burners on an immense and seriously out-of-control stove. In part three, a homeless and destitute Alberich makes Molotov cocktails; a blow to a high-pressure hose does in the dragon, which is a modified crawler tractor from which Fafner falls, his shirt stained with transmission fluid; and the bird keeps up with forest goings-on by means of an iPad. In the finale, the Norns are cable workers, Hagen and Gutrune start out sitting in bed together, the huntsmen are armed with a combination of AK-47s and contemporary crossbows, Brünnhilde addresses and reassures the Rhinemaidens before her immolation - and then, as Hagen bites the dust, a robed child, perhaps the (lower-case) savior of the world, processes to the front of the stage to plant a new ash tree as the planet will clearly go on. Projections are ubiquitous, and some are disorienting or disconcerting. But, as with the sets, traditionalists may concentrate instead on the music. At first, this Francesca Zambello Ring struck this observer as fraught with problems, but the further into it we progressed, the more I liked it, and the more I've thought about it after the fact, the more impressed I have become. My first live Ring components involved Birgit Nilsson & Company, and I'd grown up listening to pirated recordings from the Met, from the Flagstad era and later. In all those cases, the music was the prime attraction. In San Francisco, the orchestra, conducted by Donald Runnicles, was reasonably solid. He didn't come across as a great Wagnerian, but he did what opera conductors are expected to do nowadays - he provided a mostly-reliable foundation for the singers, generally responding to their vocal needs. The singers in turn had been beautifully prepared for this mammoth combination of music and drama. There were many examples of this, exemplified in such minor effects as enactments of stage business precisely coinciding with musical cues. Like some of the orchestral soloists, the singers were a somewhat mixed lot. The aforementioned Alberich, Gordon Hawkins, impressed from the outset, Elizabeth Bishop was a radiant Fricka, and the voice of Erda, Ronnita Miller, seemed to emerge from the very bowels of the terrestrial sphere. There was much to admire about the Wotan of Mark Delavan; here's hoping he continues to grow into the role and can provide us hours more listening pleasure downstream. The Mime of David Cangelosi was strong but stronger still in Siegfried. But all that said, the star of Rheingold, to these ears, was the Loge of Stefan Margita; he best exemplified the notion of great Wagnerian singing some of us recall - or think we do. So this one was sort of a draw, along gender lines, but the strong women took a probable edge. 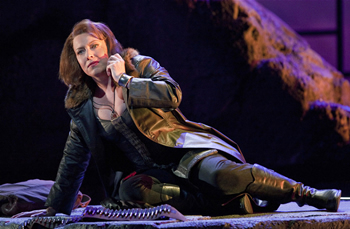 There were some issues in Walküre, but let's say this up front: Nina Stemme is a great Brünnhilde by any standard, in any setting or costume - it would be worth a cross-country trip to hear her in any of these Ring operas and especially in all three of the ones in which her character figures. She has the vocal polish and delicacy of a major Lieder singer and the vocal heft required to scale those Wagnerian peaks, she looks good on the stage, and she can act. The weak link in the cast was Daniel Sumegi, as an insufficiently dark and sinister Hundig - we can hope he was merely having an off-night. As Siegmund, Brandon Jovanovich seemed a bit stiff, vocally, but he and the Sieglinde, Anja Kampe, made the final scene of Act I a thing of often radiant beauty. All the Act II set-ups of the ensuing action came across as dramatically and musically apt. The Valkyries, done up as paratroopers, produced a generally impressive musical ensemble with lots of good singing and very little screeching. Stemme again commanded attention in her every appearance, bringing nuances to her interpretation that cast the role in a whole new light. Delavan more than held his own, and the crushingly beautiful finale of Act III worked its customary magic (no pun intended; the orchestra excelled here, too), but Stemme was without question the dominant artist, and she thus took the top prize. This production uses a young and then a more mature Siegfried; in the third opera, Jay Hunter Morris seemed underpowered and a bit ill-at-ease on stage, one result of which was that the powerful portrayal of Mime by David Cangelosi commanded more attention than the role often does when sung in Siegfried's shadow. Cangelosi also did more singing and less whining than some, making this performance one to remember for its vocal appeal. The interactions of the Wanderer and Alberich were vocally secure and dramatically effective, and the Bird, sung by Stacey Tappan (who also portrayed Woglinde), was positively vibrant, but it was again Stemme who brought home the vocal glories. The setting of the first part of the Götterdämmerung Prologue was dark and off-putting to this critic, but the singing of the Norns - Ronnita Miller (our Erda), Daveda Karanas, and Heidi Melton - was wonderful in both solo and ensemble passages. The drama of Act II played out with stunning theatrical effectiveness, and there was considerable strength among the singers - Ian Storey as Siegfried, Gerd Grochowski as Gunther, Andrea Silvestrelli as Hagen, and Melissa Citro as Gutrune - but the Siegfried soon ran into vocal problems and by the end of the act there was virtually nothing left. (He continued in Act III but was unable to project much Heldentenor power.) The Rhinemaidens police the wasted riverbed for trash at the start of Act III and Siegfried misses his last chance to set the world to rights; the scene worked surprisingly well, given its departure from expectations and Storey's vocal indisposition. The death scene, funeral music, and denouement went well, capped of course by Stemme's magnificent singing. She never seemed to hold back and at the end there was as much power as she'd projected at the outset of her wholly captivating and engaging portrayal four days earlier. There was enthusiastic applause for everyone, but Stemme's ovation was the largest and most protracted - it brought to mind the outpouring of affection and appreciation that always heralded La Nilsson, underscoring the magnificence of Stemme's triumph in that wonderfully visceral way that is unique to opera in general - and Wagnerian opera in particular. A strong and immensely gifted woman? You bet! Don't miss seeing and hearing her. And as for the production, and why it looks better in retrospect than some of it did as it unfolded? I suspect that folks seeing this Ring for the first time, people without the encumbering baggage of previous experiences with the operas - and particularly younger people - will crave Zambello's updating and then, through it, identify even more closely than might otherwise be the case with the timeless and universal themes - greed, deceit, and deception - that form the very human backbone of Wagner's amazing cycle. Look for it in HD theatres and on DVD in due course! And come to think of it, when Zambello does it again, maybe she can set the cycle in the US Congress or one of the many corrupt legislatures that dot our nation. PS A single gee-whiz trivia item from the SFO's exhaustive press materials: "Each cycle of the Ring will take 14 terabytes of data to record video and audio. That's equivalent to about 350 home computers of storage per cycle." On a free evening between Walküre and Siegfried, the San Francisco Symphony hosted the visiting critics (and a whole slew of other music lovers) for a richly rewarding concert mixing Bartók - the Rumanian Folk Dances and the Second Piano Concerto - and music from Act III of Tchaikovsky's Swan Lake. It's curious that music from this ballet turned up recently in Cary, on one of William Henry Curry's classical programs there, with the NC Symphony (reviewed by Ken Hoover). In San Francisco's Davies Symphony Hall, Music Director Michael Tilson Thomas did the honors and Yuji Wang was the distinguished and powerful soloist (or, to continue our theme, the evening's strong woman). There was breathtaking delicacy in some of her playing, delicacy that was at times swallowed up by the orchestra. (I was reminded that the hall is somewhat quirky, acoustically, but it seemed better by far, following its up-fitting, than it did when I was last there, in the late '80s(!).) This was a memorable reading from a young pianist who played Rachmaninoff with the NCS in Chapel Hill last season and who returns for a gala with the orchestra next May. All that said, Bartók remains a challenge for many listeners, so it was good to experience this superb orchestra - one of our nation's best, and under the leadership of the man who has almost certainly done more for music education in this country than anyone since Leonard Bernstein - in a big hunk of a great Tchaikovsky ballet score. The playing was incisive and animated, and the orchestra positively glistened as the music unfolded before our ears. With so many of our orchestras in NC stuck at the 65-70 player mark, it's always a treat to hear a well-maintained symphonic limousine - of which the SFS is certainly one. On the other night off from the Ring, the critics traveled by bus to Berkeley for a strange lash-up of Civil War songs with percussion and keyboard accompaniment, staged by Peter Sellars as part of Ojai North's summer festival offerings. The soloist in the first half was Dawn Upshaw, an artist - and strong woman - of stellar caliber, who was last heard in NC, at Duke, in February 2008. This time she portrayed an Afghan War vet under therapy (in a hospital bed, but in cammies and combat boots), suffering from PTSD. The settings were by George Crumb, and there was virtuosity in the singing, the playing of the red fish blue fish percussion ensemble (based at UC San Diego), and the often-percussive work of keyboardist Gilbert Kalish (a legend in his own right). Part two of this program, titled "The Winds of Destiny," was given over to a considerably more upbeat presentation of traditional and (presumably) contemporary Afghani music, sung and played by refugees who now make their homes in the Bay area. This half provided a transfiguration of the downer of the first part into something of an upper, although the program went on entirely too long. I am sorry, but my enthusiasm for war protests in the form of art music began to wane during the late '60s. Crumb lived through that era, too, and he should have known better. (On the other hand, it's been 42 years - as of this month - since my ship came back from Vietnam - our first stateside port of call was San Francisco - and I realize that, for our younger vets, the wounds are far more fresh….) Still, let us thank God for good world music! This war will end, culture will survive, and these Afghani artists will continue to enrich our "hearts and minds," literally, long after that cliché has slipped from common usage. Oh, and one more thing - some of the art owned by Gertrude Stein was (and is) on display in concurrent exhibitions at the San Francisco Museum of Modern Art and the Contemporary Jewish Museum. Just for the record, she was yet another strong woman! Finally, because readers might wonder about the overall state of criticism, given that this was an MCANA annual meeting, I am pleased to report that the attendees seemed a good deal more positive this time than during other sessions in recent years. Some of us still work for real papers, and there's hope that these holdouts will be sustained. There are some new folks entering the trade, including Paul Hyde, a young man with a real job at a real paper in Greenville, SC. The Association has made big advances in the benefits it offers members, beyond annual meetings in interesting places and opportunities for fellowship and networking with peers from all over the continent: there's a new blogging platform - our colleague Roy C. Dicks is a regular contributor - and a budding national online arts journal for classical music (based in part on work being done by SFCV and CVNC), and there seem to be many more training opportunities for critics now than in the past. It's true that more and more of us are working online - even the print people are online now - but morale within the ranks is high, and things are definitely looking up. Stay tuned! Note: For an article on early recordings of the music of Wagner, click here.